The most talented Modernista painter and graphics designer was flamboyant, Barcelona-born Ramon Casas i Carbó (1866–1932), known as the ‘Catalan Toulouse-Lautrec’. Like the French artist, he had the good fortune to be born into wealth; he father was a risk-taking 'indiano' who had made his fortune in Cuba, and his mother came from a prominent Catalan family, and neither had the least objection, it seems, when their youngest son announced at age 11 that he wanted to quit school and apprentice himself to artist Joan Vives. By the time he was 15, in 1881, he had met other young artists, poets, and intellectuals and with them co-founded the magazine L'Avenç, publishing in it his first known drawing before going off to Paris as its correspondent. In Paris, Casas attended the Académie Carolus-Duran, the same attended by American John Singer Sargeant, who would be one of his inspirations, along with Manet and Whistler. Although the Impressionists had just then begun to impress (Monet and his friends held their first show in Paris in 1882) Casas was not the least interested in their goals of catching the light and colour of a moment: his work would always be mainly tonal, even monochrome. In 1883, a Self portrait as a Flamenco Dancer was accepted at the salon. In Barcelona, he frequently exhibited at the Sala Parès near Santa Maria del Pi at the time the city's only commercial art gallery, and travelled a great deal, including a trip in 1889 around Catalonia made with his great friend, Santiago Rusinyol that resulted in a book, Por Cataluña (desde mi carro). Thus it came about that Casas and Rusinyol, who were in fact peripheral to the newer energies of Parisian culture and, beyond their amiable dandyism, rather conservative at heart, rapidly acquired the reputation of sophisticated and even shocking innovators in their native Barcelona. Eventually, both Casas and Rusinyol made Barcelona their base. Frustrated with the city's narrow minded art critics, they founded a bar inspired by Le Chat Noir in Paris, called Els Quatre Gats, along with Utrillo and Casas's mate, the eccentric Pere Romeu, who became the front man in the bar. They held exhibits; Casas created posters, adverts and produced magazines. 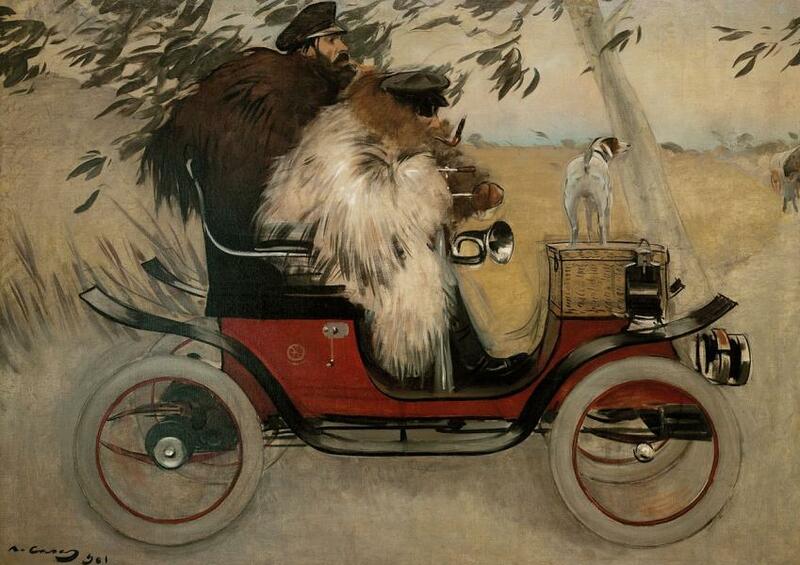 It was during this period that Casas developed his graphic, Moderniste style, especially the famous dual portrait of himself and Pere Romeu on a tandem bicycle, now among many of his works in the Modern Art section of MNAC. He was also the first man in Barcelona to own a car, and he documented that as well. 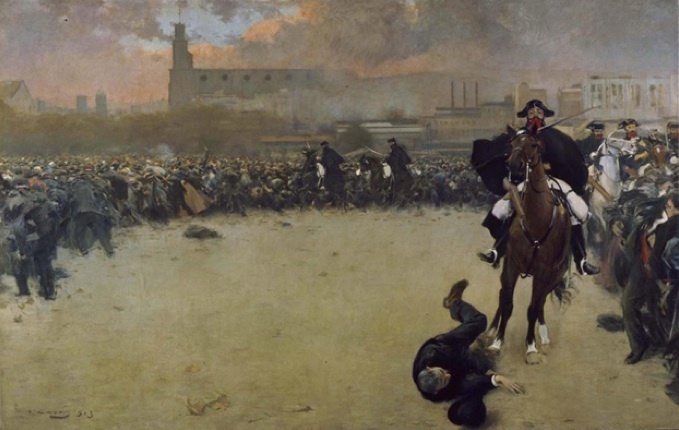 His reputation spread abroad, thanks to his society portraits and at home in Barcelona, with his bold, almost photographic scenes of some of the most violent political events of the age: the Vile Garroting (1894), showing the execution of Santiago Salvador, who bombed the Liceu, the The Corpus Christi Procession leaving Santa Maria del Mar (1898), depicting the moment just before a terrorist bomb went off, and The Charge or as Casas renamed it, Barcelona 1902 after a recent general strike. Before Gaudí built the Pedrera, Casas commissioned a Modernista house nearby at Passeig de Gràcia 96 from Antoni Rovira i Rabassa. With Rusinyol living in an apartment on the third floor, the casa of Casas immediately became one of the artiest houses in the Eixample. For decades it hosted the city's best known design showcase, Vinçon, until austerity caught up with it and it closed in 2015, with plans to reopen it as a shop with 'more touristic appeal'. If so and if you can get in, don't miss the famous fireplace shaped like a yawning mouth, or the striking view of La Pedrera from the garden. Along with Rusinyol, Casas continued exhibiting in the Sala Parès gallery, with occasionally contributions to Modernista projects (perhaps most famously the mermaids he painted in the Hotel España), but after the First World War he turned his virtuoso technique to churning out beautiful slush, society portraits and advertisements that put him in great demand, especially in America after Charles Deering took him under his wing.